We DELIVER prescriptions right to your door for FREE. 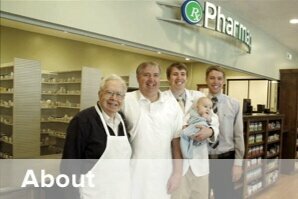 Personalized service and shorter wait times is what you can expect from Meier's Pharmacy. We're local, we care, and we understand the value of our customers. Your co-pay will be the same. Meier's Pharmacy offers a broad selection of distinctive merchandise, including gifts, home decor, unique kids toys and speciality candies. Enjoy browsing the store while you wait for us to fill your prescription.